What a custom! Vibrant, splendid, colourful, joyful, loud, proud and every superlative you can think of. A custom which is British terms is 50 years young (or so). A custom which draws at least a million visitors, something that many other customs would love to achieve. A custom which despite its firm fixture in London’s event calendar is one which has had a turbulent history and continues to attract problems, although considering nearly a million people attend statistically this is likely. Arriving just before the 10 o’clock starting point the first observation is that it does not look like it will start on time! Indeed, the large numbers of police I was expecting them to form a procession – a police procession now there’s a thought- soon though one can hear the pounding sounds and a swirl of colour – mainly the bright green of the stewards – a mix a wash of gold. Soon the Carnival begins with this first procession, dancers wrapped in gold and holding aloft huge hands with 50. Celebrating 50 years (young) of the carnival, although this was also celebrated in 2014 and 2015. Then there was a big gap – which seemed like 30 mins – the next float. This is the first of 60 floats and countless colourful costumes, it will be a long day if you wait for it all to pass by. Many of course eschew the parade and stick to the 38 static sound systems dotted around this small enclave of west London. These floats are not like your usual float crammed full of themed participants, there would not be room, much of it is full of booming bass and tweaking speakers. 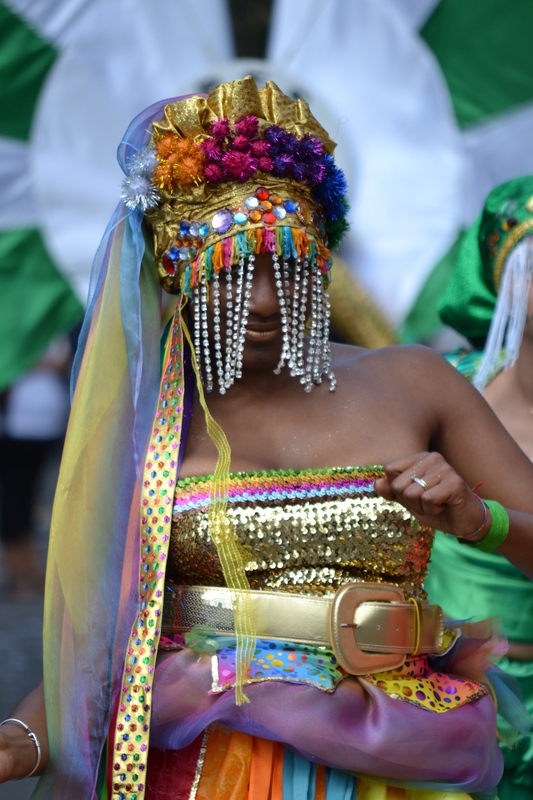 Surrounding each float are some of the most wonderful costumes to be seen outside of the Rio Carnival. Massive tableaux of faces, feathers, bright vibrant colours. 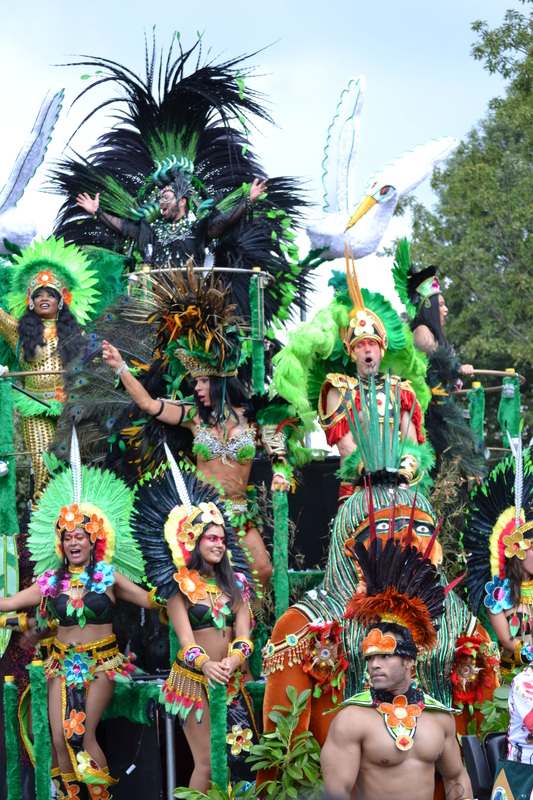 Samba dancers brightly adorned in their feathers and revealing costumes weave in and out dancing to whip up the crowds. 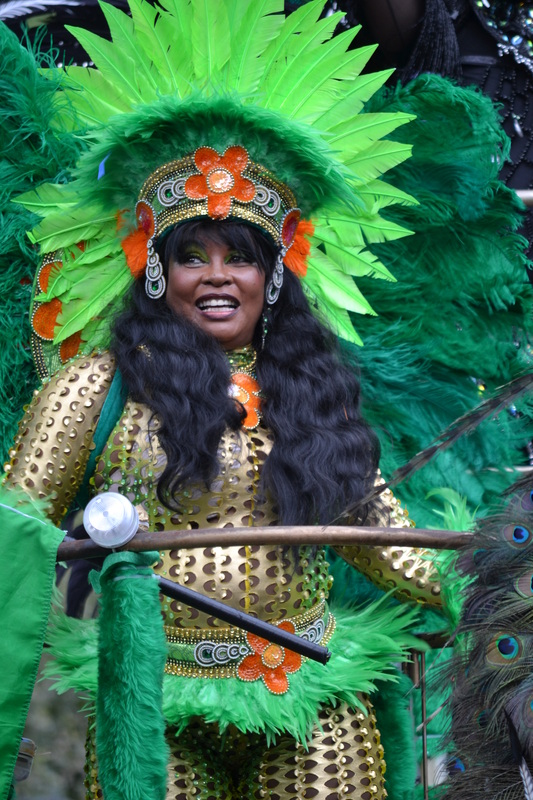 Sounds of calypso, soca and reggae boom from the floats and bounce around the street. By the early 70s greater sponsorship thanks to an enterprising local teacher by the name of Leslie Palmer, resulted in an increase in steel bands, reggae groups and sound systems. The event begun to develop into two strands, a masquerade procession with floats and the establishment of stationary islands with their own sound systems. From what clearly appears to be a very valid celebration of Caribbean culture was not popular with the authorities to begin with. The riots did not help in 1976 when disaffected youths battled with police and as a result for a long period of time this became the unfortunate media representation of the colourful event. However, such action could have been a result of heavy handed approaches of the police and the constant attempt to ban the event. It would not be until 1987 that the Carnival was officially allowed to take place. This has not prevented trouble (five deaths in the years since) or the need for high levels of police, but it has certainly reduced and fallen away to the fringes. Troubles and occasional serious crimes still arise from time to time – with around a million people swarming the narrow streets it’s not difficult to understand why something could boil over – but the media is much more favourable and is seen by the authorities as a celebration of London’s multicultural society. 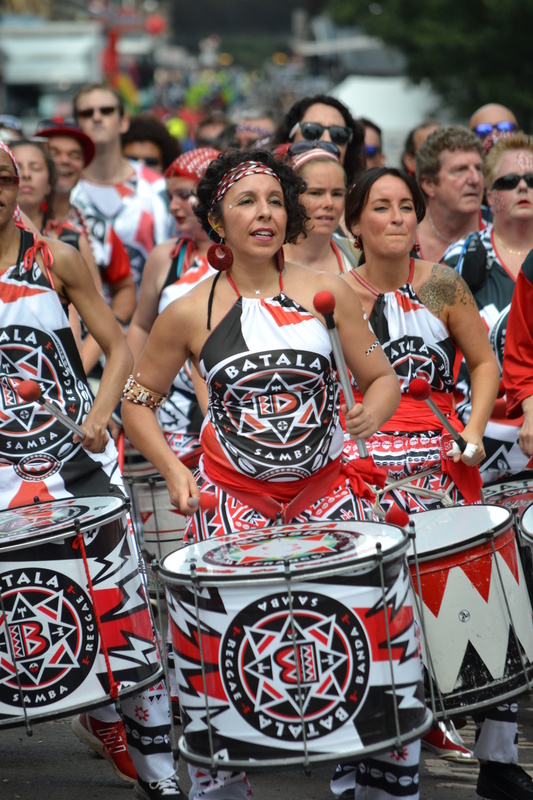 In a way, the Notting Hill Carnival typifies how customs become hybridised. 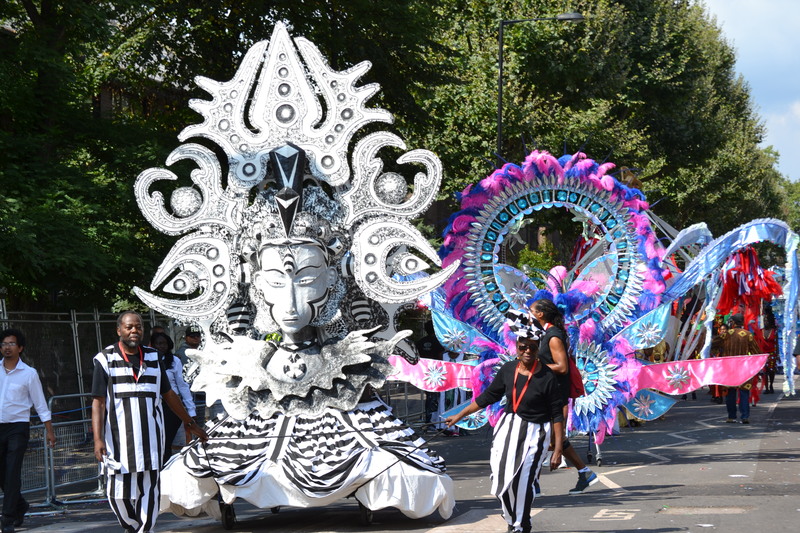 Carnival is of course a Roman Catholic tradition brought over from France and Spanish colonisation. Through in the displaced masses of the African slave and brought back to Europe to be enjoyed by all races. All human life is here, of all ages, sexes and races. Despite the problems which create a sometimes poor reputation I would recommend the sounds and sights (and smells…of diesel and other intoxicants) to anyone. If you want to miss the crowds get there for the start and near the start and you’ll find it a pleasant experience. Go on experience it..